Ultima creator Richard Garriott is returning to his roots with an all-new fantasy MMO, and a Kickstarter. The "Lord British Presents" countdown has hit zero, and what has Lord British presented? Shroud of the Avatar, a new MMO that hearkens back to his early work on the classic Ultima series. It's not actually an Ultima game, but the connections are obvious, from the use of "Avatar" to the promise of meaningful choice and moral quandaries in a living, breathing world, and even the font used in the title. The map revealed earlier today on the "Ultimate RPG" Facebook page is also a tad familiar, which is to say that it's nearly identical to the land of Sosaria on the old Ultima III map. Shroud of the Avatar will offer all the usual MMO amenities, including housing, crafting and PvP, but the intent is to give everything purpose and value while avoiding the pitfalls of conventional online games. The Kickstarter page doesn't go into detail but claims that the crafting system will avoid "busy work," and "an incentive-driven system will draw players into the challenge and intrigue of the PvP experience" while at the same time minimizing the hassles of griefing. 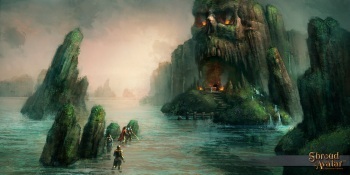 Kickstarter rewards range from $10, which gives you a chance to support development in order to make up for all those Ultima games you pirated when you were a kid, to $10,000, which earns you a guided tour of Britannia Manor, Garriott's crazy-cool home, and a rare, original copy of Akalabeth: World of Doom, the pre-Ultima game Garriott created while he was still a teenager. Garriott is after a million bucks with the Shroud of the Avatar Kickstarter, which will run for just 30 days and end on April 7. It's a bit of a crunch, but things are looking pretty good at this point: Less than an hour after it was revealed to the world, it's already attracted more than $100,000 in support. Shroud of the Avatar is being developed for Windows and Linux-based PCs, and Mac, and according to the estimated reward delivery date, will be in some state of readiness in late 2014. For more information, go to shroudoftheavatar.com.